Easter - the perfect opportunity to get rid of all the winter decor and exchange them with colorful and fresh spring decor! 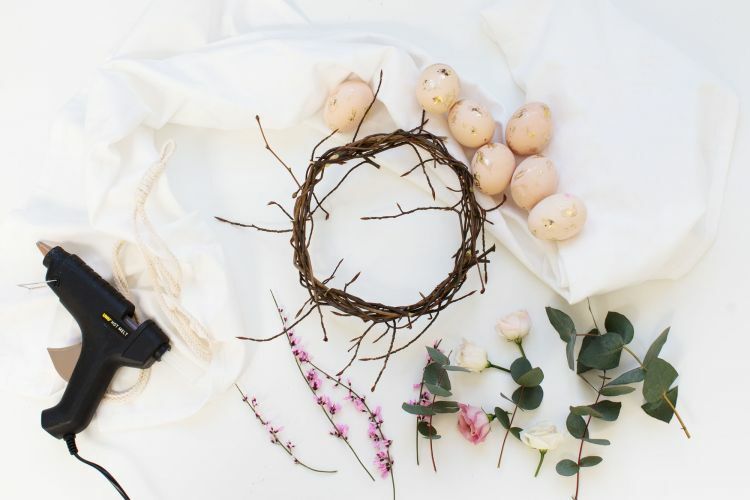 In this DIY, we are showing you how to craft your own easter door wreath with fresh spring flowers and shiny blown out eggs. Blown out and decorated eggs - we are using the easter eggs with gold leaf marbling from our DIY. Spring flowers. Either fresh, dried or artificial ones. We are using fresh pink broom, eucalyptus and small roses. Make your own wreath out of small twigs* or take a bought wreath or hoop. Pick your favorite blown out and colored easter eggs - we are using the ones from our DIY with a gold leaf marble effect - and choose matching spring flowers for the wreath. Lay out the flowers and stick them into your wreath. If you are using a metal or wooden hoop, jetzt stick them on with the hot glue gun. Now take your easter eggs and glue them onto your wreath as well. Let it dry and put a string on your easter wreath or stick it on a nail in you wall or door. That’s it: Your easter door wreath is done! 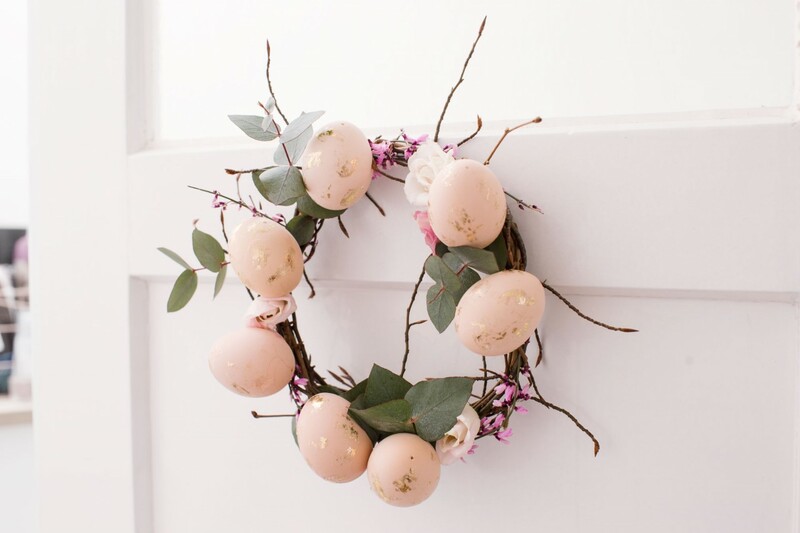 Hang your self-made easter wreath on your front door, use it as the centerpiece of your easter table or hang it on your wall to create a spring eyecatcher! * To make your own wreath, you’ll need brushwood (small, bendy twigs) and a bit of patience. Create a hoop out of one rather large and stable twig, hold it in place and wrap another, smaller twig around it until the “seam” of your first twig is secured. Continue with more twigs until your wreath is as big and and stable as you want it to be.